Exports of U.S. beef and pork enjoyed their best month of the year in June, rising both in volume and value over 2012 levels, while lamb exports continued their steady increase, according to statistics released by USDA and compiled by the U.S. Meat Export Federation (USMEF). Pork exports in June increased 2.4 percent in volume to 169,098 metric tons while edging a fraction higher in value to $469.7 million. Beef exports fared even better, rising 8 percent in volume to 101,720 metric tons and 21 percent in value to $562.3 million. Lamb exports also continued to grow, jumping 29 percent in volume to 1,423 metric tons and nearly 4 percent in value to $2.5 million. “There is no question that challenges persist, such as the continued closure of the Russian market, but we are seeing positive signs from key markets, including Japan and Mexico, that are vital trading partners for our industry,” said Philip Seng, USMEF president and CEO. Another positive growth metric in June was the per-head export value recorded for both beef and pork. Beef export value was a record $260.21 per head of fed slaughter, a $56.31 increase over June of 2012. For pork, the per-head export value was $57.27 in June versus $54.78 last year. Top performing beef export markets in June (by volume) were Japan (+66 percent), Hong Kong (+156 percent), Mexico (+14 percent), Taiwan (+400 percent) and Central/South America (+62 percent; growth mainly to Peru and Chile). The absence of exports to Russia continues to be felt, as the 5,903 metric tons of beef exported there last June made it the No. 6 market for U.S. beef. Pork exports to Mexico increased 20 percent in June, pushing the first-half total nearly even with last year’s record pace. Other top pork export growth markets in June (by volume) were Japan (+4 percent), China/Hong Kong (+15 percent), Central/South America (+54 percent; mainly to Colombia, Honduras and Chile), the ASEAN (+26 percent; mainly to the Philippines), Caribbean (+36 percent; mainly to the Dominican Republic) and Taiwan (+67 percent). Strong buying from Mexico likely helped propel heavy hams to over 90 cents per pound by early June, a 22 percent increase compared to last year’s prices. But access to Russia will become increasingly critical as we move into seasonally larger pork production. For the year, U.S. beef exports are down 1 percent in volume at 542,560 metric tons but 6 percent higher in value at $2.83 billion. Total beef exports (muscle cuts plus variety meat) accounted for 13.6 percent of U.S. beef production in June, up from 12 percent last year. For the year they account for 12.4 percent of production, about the same as last year. June beef muscle cut exports accounted for 11 percent of production (up from 10 percent in June 2012). For the first half of the year, exports accounted for 9.6 percent of beef muscle cut production, about the same as last year. Pork exports for the first half of 2013 are down 7 percent in volume and value to 1.05 million metric tons valued at $2.94 billion. Total pork exports (muscle cuts plus variety meat) accounted for 28 percent of total U.S. pork production in June versus 26 percent last year. For the year they equate to 26 percent of production versus 28 percent in 2012. June pork muscle cut exports accounted for 24 percent of production (up from 23 percent in June 2012). For the first half, exports accounted for 21.7 percent of muscle cut production, down from 24 percent last year. Lamb exports continue to be led by Mexico and Canada. For the year, total lamb exports are up 17 percent in volume to 7,263 metric tons valued at $15.7 million, a 25 percent jump. 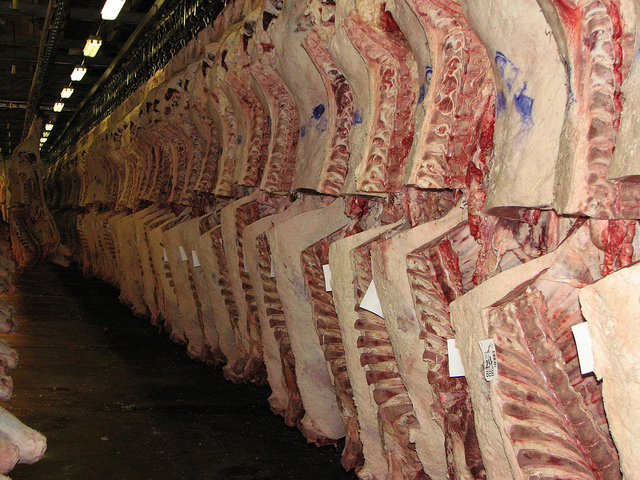 Complete export results for U.S. beef, pork and lamb are available online.